Forman Mills, one of the fastest-growing major retailers in the off-price apparel sector, announced the grand opening of its newest store in Chicagoland. This location is the third to open this year and pushed Forman Mills regional footprint to seven; second in size only to its home base in PA, NJ and DE. Just in time for holiday shoppers, the new Forman Mills boasts 77,000 square feet of designer fashions, outerwear, footwear, accessories and home goods all to be sold at significant discounts on high-profile brand name apparel. 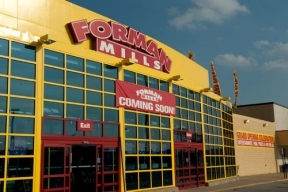 Catchy slogans that challenge shoppers to “Stretch Those Bills” and bright yellow facades help make Forman Mills a powerful and recognizable force on the retail scene. With core price points of $10 and $5 the discounter is expected to be heavily leaned on as buyers search bargains through the season. “It was important to us that we get the store open in time for holiday,” said Richard Forman, the company’s founder and CEO. “Forman Mills delivers the fashion people are seeking without breaking the bank. Families are struggling and we’re eager to help residents stretch their hard-earned dollars that much further.” With the opening of the new Burbank, Il, the company will have 33 store locations. Hours of operation are Monday – Saturday 9 a.m.–9:30 a.m. and Sunday 10 a.m.–7 p.m.